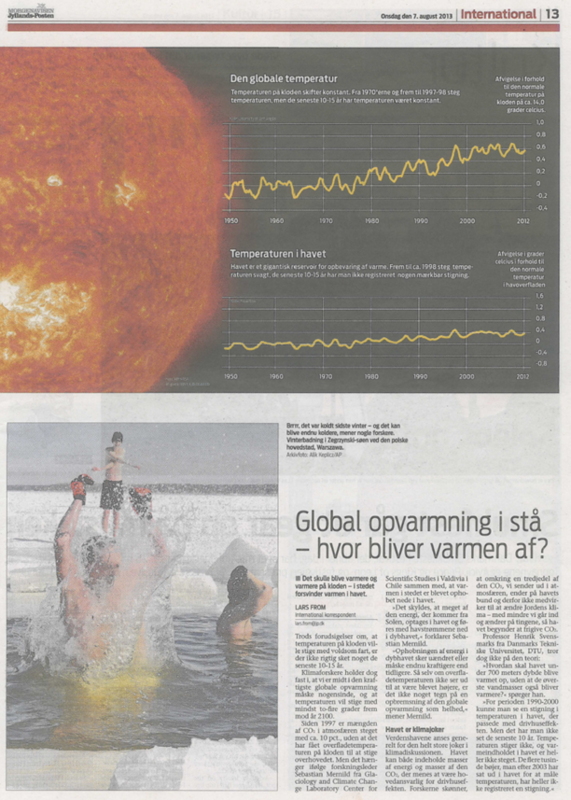 Major Danish Daily Newspaper Warns: ‘Globe May Be On Path To Little Ice Age…Much Colder Winters…Dramatic Consequences’! Another major European media outlet is asking: Where’s the global warming? 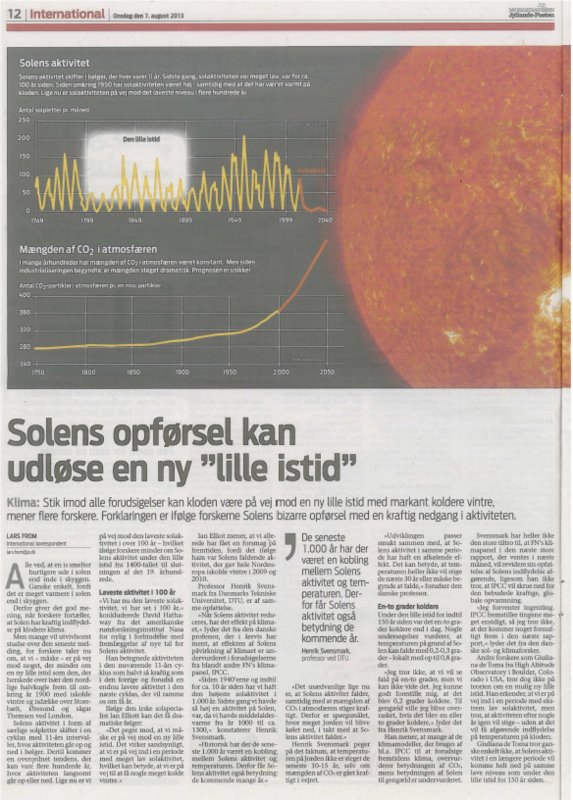 Image right: The August 7 edition of Denmark’s Jyllands-Posten, featured a major 2-page article on the globe’s 15-years of missing warming and the potential solar causes and implications. Moreover, they are featuring prominent skeptic scientists who are warning of a potential little ice age and dismissing CO2 as a major climate driver. And all of this just before the release of the IPCC’s 5AR, no less! So now even the once very green Danish media is now spreading the seeds of doubt. So quickly can “settled science” become controversial and hotly disputed. The climate debate is far from over. And when it does end, it looks increasingly as if it’ll end in favor of the skeptics. The JP writes that “many will be startled” by the news that a little ice age is a real possibility. Indeed, western citizens have been conditioned to think that nothing except warming is possible. Few have prepared for any other possibility. In its latest 2-page report, the JP now appears to tell its readers that our views on climate science have to be much more open minded and unshackled from the chains of dogmatism. JP starts by reminding readers that it was just over 100 years ago that the world had clawed itself out of the little ice age, which extended from 1400 – 1900, a time when the Thames river often froze over. All paths in determining the cause of the little ice age all seem to converge to a single factor: solar activity. Where did all the heat go? In the second part (see right) of the JP’s feature story on climate science, the daily asks whatever happened to all the missing warming?